This scenario builds 6 historic Passenger routes across America, as well as a few key American Industries. 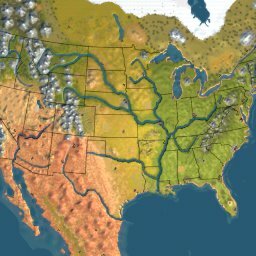 This scenario uses Stormfather’s America Map. There is however a bug in one of the XML files…whenever you try and create an Annex at a Lumbermill..
Alright, I’ve fixed the mentioned xml. All should be good now. Thank you for reporting it. The map loads OK, But when I save the game, then reload the save, the game crashs to desktop. How much RAM do you have and did you use the 3GB enabler? I have 4GB of DDR2 , Where do I find the 3gb enabler?? And my video card has 256 GB of Ram. I got the map to run, That is a lot of passengers to meet by deadline. I don’t see any Nitrates, Livestock or Swine on map, as I played pass deadline, turn some of the passengers trains into Freight Trains. As Freight Trains make a lot more Money, As I like buying Industrys. Any ideas why this map will crash about 1895 and not go past then? I have the Vista fix from this site enabled and other maps work fine – the other America map works ok.
Now I can get to 1936 before it dies. Any ideas? Updated again, minor update hopefully it fixes it. Warll i started playing the map and got like 2-4 minutes in the game and then it crashed -.- i got the 3gb enabler and had 3 computers playing, i dont know what caused it and i played the first american map i got 15 minutes in the game and crashed got 3 cpu there too and had fpk files in custom asset what hapend? Try using Map Shifter C.
Try only having SMR running while you’re playing. It was still crashing on me when trying to create a Lumber Mill Annex. In the RRT_Depots_America_s02.xml file, it was listed as LumberMill Annex (LumberMill as single word). Putting in a space between Lumber and Mill (e.g. “Lumber Mill Annex”) corrected the problem. I was having the same issue with the Lumber Mill Annex but the fix above worked a treat. Thank you Dave. Played it on RB and 2 AI. Was pretty easy… make a lot of money fast, buy the AIs, and then just set up your routes. Didnt really care for it, but it might be good for intermediate players. Crashes around 1921…Played amazingly until then. From my experience, the window does not scroll far enough to the East. However, a bit of map turning will reveal San Francisco. I was really enjoying this map but 30 years in I got to the point where I kept CTD’ing. Shame as this was a really good map. SMR can’t handle this map even the game was modified by 3GB Enabler. There’re many things in game after playing dozens of years. Как сомому создать карту ? Hello, i have a MacBook Pro , early 2013, System Mountain Lion, with 8 GB RAM, and the map crashed after 20-25 years.